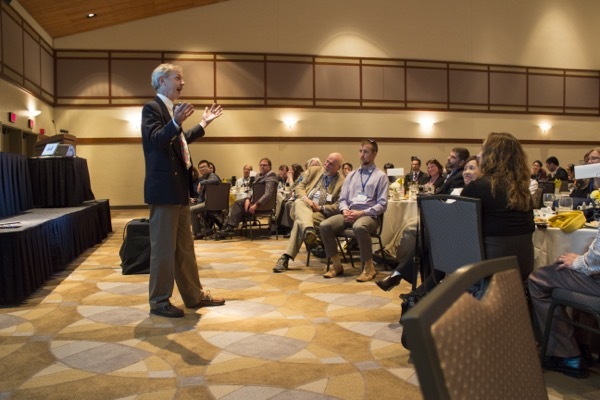 Mechanical engineer and entrepreneur Ralph Cope, of UD’s Class of 1978, delivered an engaging keynote, offering 11 tips for work and life drawn from decades as a researcher, businessman and family man. 1:10 p.m., May 8, 2015–Highlights from years of inquiry, testing, discovery, thinking and rethinking were on the easels and projected on screens in meeting rooms throughout Clayton Hall during the fifth annual University of Delaware Graduate Research Forum in April. But the future, too, was on the minds of many participants – how to transfer that work and expertise from the University’s labs and classrooms into other arenas. Guest speaker Ralph Cope, a member of UD’s Class of 1978, has been there and done that in some most unconventional ways. Weaving humor and pithy quotations through his talk, the engineer, entrepreneur and adventurer shared 11 tips for work and life, no matter where these students find themselves next. Taken together, they had enormous breadth, too. More than 125 graduate researchers shared their studies of such things as bacterial communication, new ways to monitor the health of bridges, measuring the political significance of social media, understanding face recognition, testing designs for wind farms, developing new ways to evaluate the condition of pipes, helping students gain confidence in calculus, using waist circumference to gauge fitness, the effects of trauma on children in India, using fluorescent labels to understand immune responses in bacteria and a reverent study of early religious texts in Pennsylvania. “The goal for the Graduate Student Government (GSG) is to promote graduate students, show off their research and give them an opportunity for professional development,” said Chris Castillo, a doctoral candidate in mathematical sciences and the president of GSG. The annual forum also provides a venue for researchers to sample the work others are doing at UD. Poster sessions are something like a cocktail party, but instead of flitting from one hors d’oeuvre to another, participants glance at a display, maybe move in for a closer look and – sometimes – linger to ask a question or hear the researcher explain a particularly vexing problem. Those encounters are among the primary reasons Castillo and GSG events committee chair Andrea Drewes and vice president Joseph Brodie put so much time and energy into organizing the forums and other events for their fellow grad students. “We often spend time in our own labs and don’t see people in our own area, much less those from other parts of the college or university,” Castillo said. A series of breakout sessions filled the afternoon, with presentations clustered into general themes including health, international issues, engineering for the future, energy, societal challenges, life sciences, environmental challenges and applied science. All sessions and presentations ended with time for questions and answers. And the interactions and new ideas that emerge from such exchanges can lead to fresh approaches in future research. • Travis Olson, studying historic preservation, who analyzed the graffiti carved into benches in Quaker meetinghouses throughout the Delaware Valley, gaining insight into the culture and thoughts of those using those spaces. Some markings may be a sort of prayer, he said, others may have more subversive motivations. • Sarah Leach Smith, studying public horticulture, who evaluated trial gardens and their impact on the horticulture industry and significance for retail customers. • Hongbo Dai, studying civil and environmental engineering, who has worked to develop a “sensing skin,” an electrically conductive composite layer that can be attached to structures such as bridges to monitor, detect and locate damage. • Erin Crowgey, studying bioinformatics and systems biology, who is developing analysis “pipelines,” using genetic sequencing data to detect alterations in pediatric acute myeloid leukemia (AML), thereby building a bridge between biological data and clinical knowledge. Cope’s 11 tips emerged from decades in academia, industry and quite a few unconventional endeavors. He is a mechanical engineer who has seen no reason to confine himself to one dimension. James Richards, vice provost for graduate and professional education at UD, said Cope was a longtime friend whose dissertation on the study of human gait laid the foundation for today’s real-time analytics. Cope had none of that. The algorithms and solutions Cope used to analyze the way people move now are part of the most prolific software tools available today, Richards said. He was on the leading edge elsewhere, too. As an undergraduate at UD, Cope became the first student member of the Board of Trustees. While working on his doctorate at Ohio State University, he developed technology for Hewlett Packard. He taught at Ohio State and UD, co-founded UD’s Orthopedic and Biomechanics Engineering Center and started his own consulting company, EPOCH, which later merged with a controls company to become Acudyne Systems, which makes custom automation equipment. Last year he cofounded Enliten LLC, which makes gait training and fall support systems for people with disabilities. Along the way he found time for two year-long voyages on a boat with his family. Know the numbers. Industry is 20 percent effort, 80 percent results. Academia is 80 percent effort, 20 percent results. Don’t go after money. Work at something that makes you happy. The money will follow. His company’s mission statement: Build cool stuff. Sharpen your pencils. No matter where you go, you’re going to have to write and put good reports together. In academia, it’s publish or perish. In industry, it’s what you’ll do next year, what you did last year, proposals for new projects, financial reports. Proofread your emails. Or try something new and pick up the phone. If an interaction feels wrong, it is. Imagine a direct-feed camera focused on you. And don’t go to bed angry. Resolve issues within an hour. Push the envelope. One thumb up is greater than 10 thumbs down. Do your best. Don’t do anything halfway. And remember that failure is industry’s form of education. Admit when you are wrong. It is often who you know. Your network is like a spider web. Use your web to catch the answer. In times of chaos, bring calm. In times of calm, bring chaos. Use suntan lotion. Use your brains and use the science you know. Work to live, don’t live to work. Work is important, but you and your family are more important. And after all that, Cope urged those in attendance not to spend much time second-guessing themselves.